Miss Trinity has overcome a lot in her short life. When she should have been frolicking and playing she was on crate rest to heal from an amputation, Trinity came to us after being hit by a car. With her veterinary team, and amount of damage it was determined that amputation was necessary. GDRNT was able to pay for her surgery and post operative care because our emergency funds were available to cover those expenses. Our emergency fund allows us to make life saving decisions without the immediate worry of fundraising. 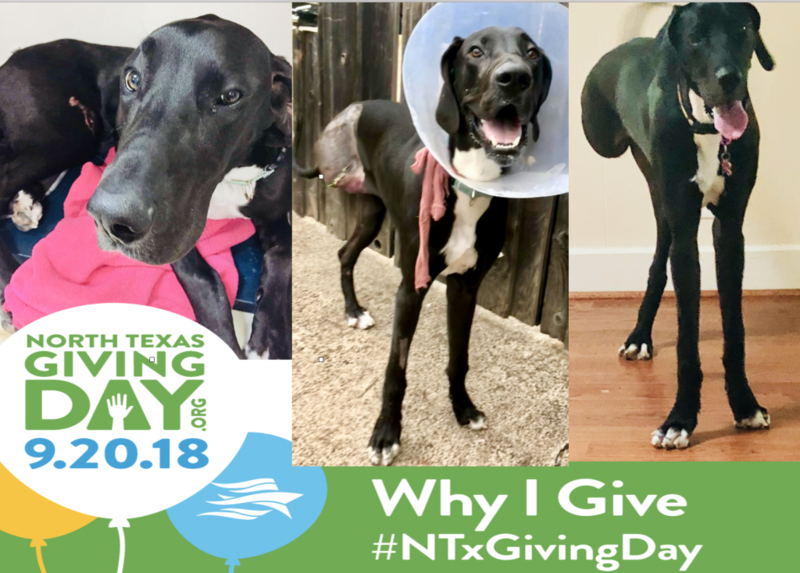 So North Texas Giving Day allows us to replenish and maintain funding above our normal monthly veterinary bills. Trinity has had to overcome some obstacles in her recovery but she has done so like a champ! Every day she gets stronger while she waits for the perfect FURever home. As an all volunteer, privately funded organization 100% of your donation go directly to the care of our foster pups! There is no monetary value for the countless hours of care, love, worry and time invested by our foster families to make our dogs ready for their FURever homes. North Texas Giving Day day allows GDRNT to make the financial commitment.